Dove, you've done it again. First comes my favourite deodorant, now my go-to haircare line. 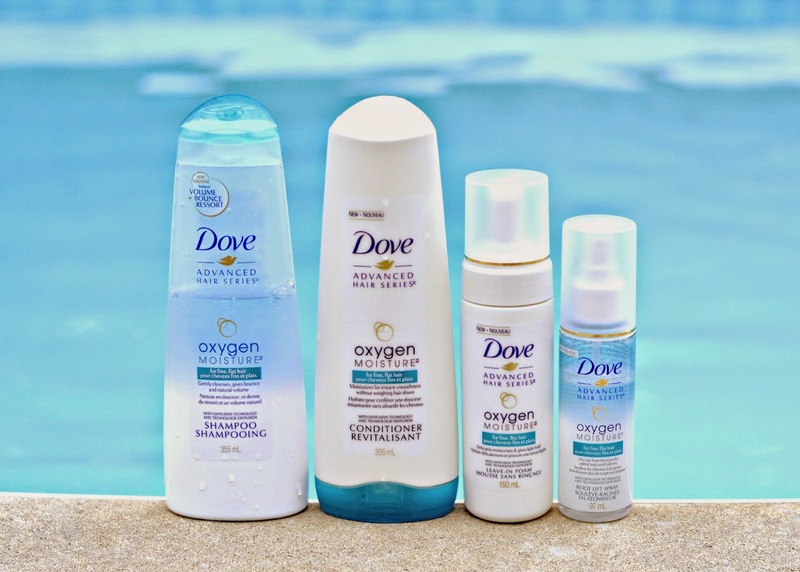 Earlier this year, Dove released two comprehensive lines of shampoos and styling products. "Oxygen Moisture" is targeted for those craving volume and bounce, and "Pure Care Dry Oil" for weightless moisture and frizz control. After reading countless reviews and trying the Oxygen Moisture line myself, I have lots to share. There's nothing worse than feeling product weighing down your hair as the day progresses. In my case, both my skin and hair tends to develop a natural sheen that goes a bit beyond "dewy" or "shimmery" especially in this blazing summer heat. Within 12 hours of washing my hair, if I don't apply some kind of styling product, my hair begins to feel heavy and greasy. After trying countless mousses, sprays, texture creams, etc, I've come to the conclusion that, although I need something to add a bit of volume, less is definitely more. After trying Oxygen Moisture, I can't see myself buying many more products at all. The shampoo and conditioner in this line smell especially fresh. The bright blue and white packaging is pretty great also, except I'd prefer if the shampoo bottle could stand upside down like the conditioner. Regardless, they do what they claim, leaving my hair feeling clean and fresh. I do notice a bit of that squeaky clean, slightly stripped texture with this shampoo, but nothing extreme like with Neutrogena's Anti-Residue clarifying shampoo. After towel-driyng my hair, I apply one pump of the mousse and distribute it from my roots to ends, followed by 6 sprays of the root lift, only at the scalp. I make sure the products are evenly distributed throughout by doing a nice little scalp massage. I then blow dry my hair with no particular system, just massaging the roots as I dry with medium heat. I find that this massaging action gives more volume right at the roots, and "activates" the lift spray avoiding any kind of sticky flatness. After this quick styling process, I'm left with some long-lasting volume that is truly weightless. The mousse and spray give just a hint of texture, and they seem to really pick up my roots to help banish the 6pm grease (ew). In the past I've enjoyed using those "beachy wave" salt sprays since they dry out my hair just enough to keep my style alive for the entire day. This system far surpasses any of those sprays since it is actually targeted for thin, flat hair like mine. Another benefit is that you could even add some extra product, like dry shampoo or hairspray, to extend your style into day two. The main benefit of this line is that it's fool-proof. Just don't use too much! Even though the products themselves aren't super high quality, they're formulated exactly how drugstore products should be: amazing scent, good cleanse, solid 24 hour performance and pretty packaging. For an entire haircare set that's just around $30, I'd 100% recommend.